This award-winning luxury cottage is a medieval Grade 2* Listed partially-moated hall-house. Sleeping up to 8 eight people makes it ideal for a larger family or group of friends. Alternatively, as it can dine up to 16, it can be booked with one or both of our other two cottages to accommodate 16 altogether, all of whom can dine in The Woodhouse itself. As a venue for a special celebration, reunion or small wedding, it is perfect. 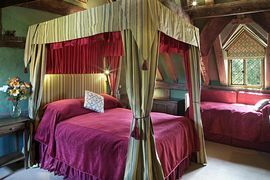 The ground floor sitting room has cushions in the oriel window overlooking the carp-filled moat, but its focus in winter is the wood burning stove, for which all logs are free. Seating is comfortable and includes two Knole sofas. There is a door opening onto the south-facing terrace where guests can contemplate the water lilies whilst sipping champagne. 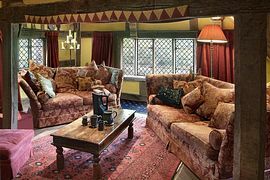 The dining room has an antique table and chairs, Jacobean press and tapestry to give an authentic feel to the room, which is reflected throughout the house. 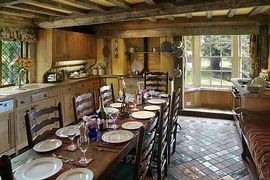 The large farmhouse kitchen has a cream Aga with additional electric oven, two gas hobs and a microwave. The floor is tiled with replica medieval tiles and is well equipped with Aga pans and enough china and cutlery for 16. The table and chairs are antique and there is a window seat in the bay window, which overlooks the garden, and an old settle. A separate larder provides plenty of storage and appliances include Miele fridge and dishwasher. The washing machine and tumble dryer are also Miele and there is a large freezer which is kept partly stocked with chef-prepared meals ready to pop into the oven if guests don't feel like cooking. From the award-winning welcome basket to the stunning fabrics, from the books games and DVDs to the extremely comfortable mattresses, we have tried to provide everything our guests might need for a holiday, which is truly memorable. A chef is available if booked in advance to cater for dinner parties, buffets and larger celebrations. Hampers are available to order. Barn Croft is full of character - originally a calf house, adjoining a stone stable with loft above. Accommodation consists of a large open plan kitchen, dining area and sitting room with wood burner and south facing views over the garden, moat and farmland. The large principal bedroom and bathroom are upstairs in the stone barn. Each downstairs bedroom has an en-suite shower. The Wainhouse provided for the storage of wagons. A single storey building, with private garden. Accommodation consists of the comfortable sitting/dining room. A very well equipped kitchen. 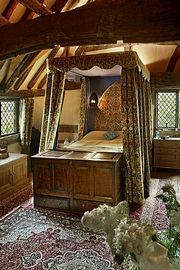 An en-suite bedroom with six foot bed, with silk-lined hangings. For more information and to see pictures of all the cottages please visit the Cottage's own website. Featured in 25 Beautiful Homes, Cotswold Life and elsewhere. Pure Egyptian cotton bedlinen with duvets. Both bath sheets and hand towels are also provided along with tea towels and hand towels for the loo. Garden and terrace with garden furniture and barbecue;table tennis table; pool table; boules; croquet. 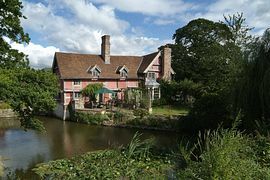 Local Services: Country pub with restaurant 5 mins walk. Railway station 5 mins. drive. Shops, supermarkets,pubs,restaurants, garage etc. in Ledbury, 5 mis. drive. Straight through Ledbury towards Bosbury on the B4214. Turn down our drive approximately 2 miles out of Ledbury between the sign saying Staplow and the pub (The Oak). 2009 - Enjoy England Awards for Excellence Self-Catering Holiday of the Year. 2008 Silver Award Green Tourism Business Award.